Here it is: a first booty bag tutorial. There are several ways to make these, and if you're going to use jeans, more than likely you will not line it (nor will you really need to). So this first tutorial is the most basic version of a booty bag: an unlined version. I will add instructions for a lined version after doing enough such projects to get some pictures. A note about pants size: the best sizes are juniors 0-5, or misses 0-6. If you want to use a larger size, keep in mind the overall bag will be larger, and may be much wider than tall. 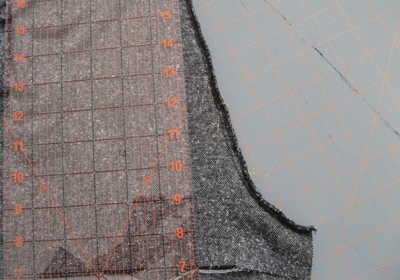 If you want to use a larger pair of pants, you can bring the proportions in by "boxing" the bottom corners (see Step 5 of the Tote Bag Tutorial). 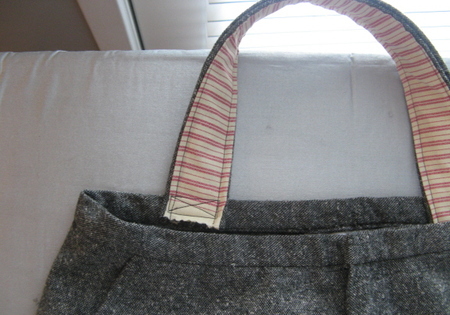 To visualize how the pair of pants you've picked might look as a finished purse, fold the legs back at the crotch. Measure the rise from the top of the pants to the crotch. 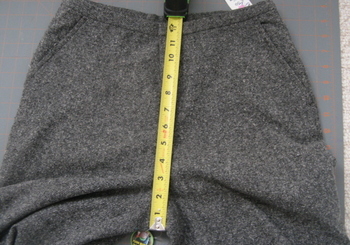 Measure this distance from the waistband down the leg all the way across and draw a line. Cut the legs at this line. If it appears uneven, don't worry. You will straighten later. 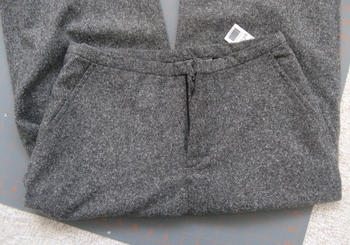 The pants may still be sewn together at the center. This is fine. Cut apart. Turn inside out. 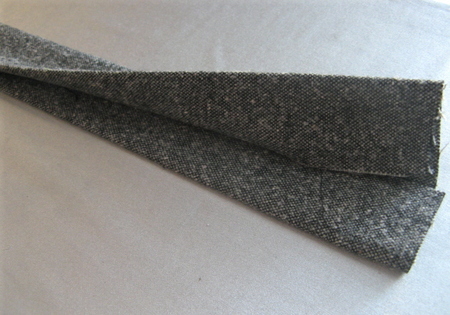 In order to make the front and back of the pants lie flat, you will need to sew a new, straighter seam down the middle. 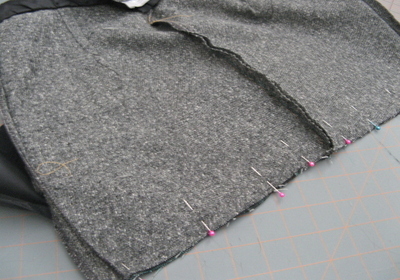 Lay the crotch area flat, marking the area with a straight line, then sew along that line and trim. Repeat the process on the backside of the pants. 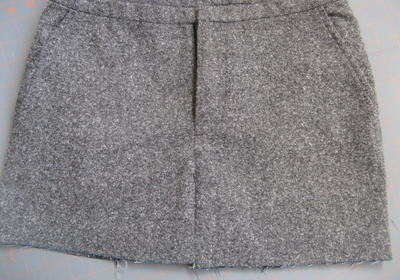 Since the backside is more curved, the line for your new, straighter seam will extend further up the backside. Now your pants look more like a skirt. 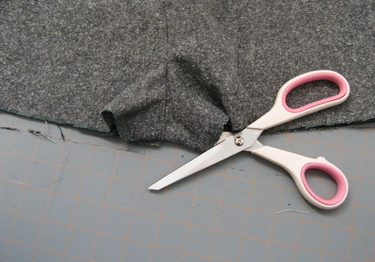 If the cut across the bottom appears uneven, straighten it with your rotary cutter and ruler now. 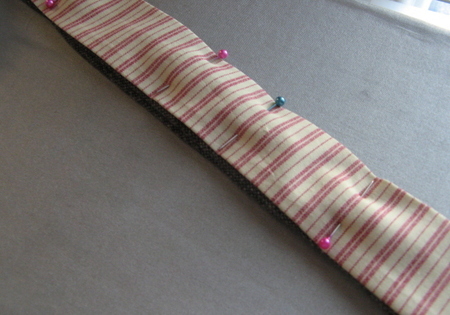 Pin and sew across the bottom. You will use the pant legs to make the handles. Cut the desired length and 4x the desired width for each handle (mine were each approx. 6"x22"). Fold in half lengthwise and press, then fold each side into the center, and press again. To attach handles to the bag, sew each handle with a square and "X" in the middle (if you're using jeans, use a size 16 or "jeans needle" - you may need to hand-turn the sewing needle during this part due to the thickness of material). All done! Very cute! Did you ever put up liner directions? I did one similar a few months ago, but am kind of at a loss to line! Muito Bonito Continua assim !! Dá maior quantidade de este blog, a todos os teus leitores. I was looking for an email but couldn't find one. I wanted to let you know that I nominated your blog for an award: for a job well done. You can find the link back to YOU on my blog as well as the button if you wish to have it. Your bag is BEAUTIFUL!! This tutorial looks super simple and fun. Thanks for sharing!! I added your tutorial to my blog (xboutiquex) of favorite crafts and tutorials. Now...I so need a new purse....headed to closet to pick out some jeans & put this tutorial to the test!! :) Thanks again! I love this version-makes a change from the denim bags. I made the same kind of bag with my daughters short denim skirt(age 4 years approx). I just added a bottom to it from a scrap piece of denim.To save making a belt, I used a knotted leather belt tied thru the belt loops on the waistband. I need to give you credit for my current Christmas idea. I've taken your booty bag and made a few changes. First off, I haven't seen a junior's size 6 in 25 years, so I took some old pre-baby jeans and created your booty bag, but with a few changes. I made the bag bigger and the straps longer, creating denim shpping bags. I left the pockets on, and embellished them to personalize each bay (i.e. cat lover had cat cutouts), then put an envelope in one back pocket and a small notepad w/ pen in the other. This way, the user will have a place for coupons & their grocery list. For Christmas we put goodies inside each bag: homemade preserves, cheese, bread, hot cocoa & mugs. A perfect gift for those hard-to-buy-for folks, and and easy way to encourage greener shopping. So, thanks for your FABULOUS idea! It was the catalyst I needed in determining which type of bag to make. You ROCK! I loved your purse. I have made several of them. Did you take the label out of yours? just wondering...do you know the game, Big Bootie?? Love this! I am going to try this....I even have what looks like the SAME EXACT pair of pants!!!! I really like your instructions on yhis project. I do have a question do you remove the brand labels from the pants? I really like your instructions on this project. I do have a question , do you remove the brand labels from the pants? Thank you for posting the Booty Bag. I have not made one yet, but I will. This pattern is soooo simple. Thank you for your insite and inspiration. I just used your tutorial to make a bag out of glittery gold pants that I no longer have the guts to wear. It's much more fun as a bag, anyway! This is just fab! I couldn't help but smile at the title! Love it! Thank you so much for this. 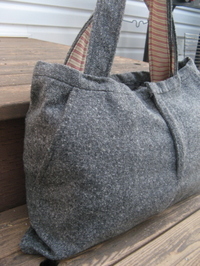 I just came over from Sew Mama Sew's holiday blog. I have a pair of boys wide wale corduroy jeans on my rocking chair in a deep green that I could not throw away. I have now found something to do with them!